While the Chandigarh Transport Undertaking (CTU) is desperate to get drivers for its buses, at least a dozen of its drivers have been diverted to driving UT Administration officials or cars belonging to the CTU. An 11-year-old boy died at his residence in Sector 21 here today trying to ape an action hero and attempting to perform a stunt with a string tied around his neck. Saurabh Sharma, son of a Punjab Police Inspector, was strangulated to death on the spot. He was a Class VI student of Manav Mangal School in Sector 21. A 50-year-old woman, Meena Sharma, faced a horrifying experience when she suffered an injury after a snatcher pulled her gold chain while she was seated on the front seat of her Honda City car. It was a dream walk for the thieves who perpetrated this crime. They walked up to the gate of a palatial house in Sector 7 by using a duplicate key, made use of a gas cutter to cut the wire mesh of the guest bedroom located on the ground floor in a corner of the house, then entered the main hall and walked up the stairs to the first floor bedroom of house owner Chander Verma’s daughter before lifting a laptop and an iPad. The General House of the municipal corporation, scheduled for tomorrow, has been postponed in an apparent bid to avoid an unsavoury situation arising out of the garbage processing plant issue. Mayor Ravinder Pal Singh has now rescheduled the meeting for September 28. The handing over of the additional charge of the post of Home Secretary to Finance Secretary VK Singh may pose protocol problems for the UT administration. This stems from the fact that VK Singh is a 1990-batch IAS officer of Punjab cadre, while Chandigarh Housing Board Chairman Satya Gopal is a 1988-batch IAS officer of the AGMUT cadre. The win of Independent candidate Hardeep Singh, a rebel Akali, over the joint candidate of the SAD and Sant Samaj, Jatinder Pal Singh, in the SGPC elections from the Mohali constituency is being seen as setback for the SAD in light of the forthcoming Vidhan Sabha elections. Riding high on her performance as the three-time councillor of the municipal corporation, former Mayor Harjinder Kaur entered the SGPC with an impressive win of 1,266 votes here today. The revised criteria of the Planning Commision for identifying people living below poverty line (BPL), which puts the per head expenditure at Rs 32 per day, is irrational and illogical, feels a cross-section of city’s population. Stray cattle, bumpy roads and lack of public transport plague Sector 26 here. While the stray cattle menace has made life hell, the absence of a developed market and an effective public transport has left people high and dry. The District Consumer Disputes Redressal Forum has directed Iffco Tokio General Insurance Company Limited to pay a compensation of Rs 50,000, along with 18 per cent as interest, to a Sector-35 resident for deficiency in service. The Mohali District Consumer Redressal Forum has directed M/s Industrial Cables, builders of Ivory Towers at Sector 70 here, to pay Rs 1.81 lakh, the difference in cost of stamp duty and registration charges applicable on Tuesday and prior to 2008. The orders have been passed on a complaint filed by Madhu Banati and DS Basanti. The District Consumer Disputes Redressal Forum has directed Andhra Bank to pay Rs 38,300 to a Sector 22-B resident for its failure to forward the premium amount to an insurance company, besides levying Rs 5,000 as cost of litigation. Mohali-based car dealer Chittosho Motor has been directed by the District Consumer Disputes Redressal Forum to pay Rs 5,34,970, the cost price of a Maruti Swift VDI car, to a Phase-VII resident on account of damage to the vehicle while with the agency for periodic service. Meaningful entertainment weaved in humour and satire, with each dialogue guarantying a spell of genial laughter, boldly discussed religious rituals fanning orthodoxy among the innocent masses on the concluding day of the second Chandigarh Theatre Festival at the Tagore Theatre here yesterday. The annual conference of Indian Society of Neuroradiology being hosted by the department of radio diagnosis, PGIMER, Chandigarh, began on Thursday with participation of over 250 delegates from all over the globe. The focus of the programme was on imaging in paediatric stroke and brain tumors. Contrary to 330 students last year, over 600 opted for golden chance at Panjab University this year to either improve their score or complete courses left midway. A curtain raiser ceremony of the upcoming 6th International Youth Peace Fest was organised at GGDSD College, Sector 32. The weeklong event will commence on the World Tourism Day, September 27, and will conclude on the International Day of Non-violence i.e. October 2. Taking a serious cognizance of the Panjab University Teachers’ Association’s (PUTA) persistent demand, Panjab University has finally put the occupancy details of three of its guesthouses online. Students desiring to register with Panjab University’s Wi-Fi system will now have to take out a subscription of at least three months. The move follows a meeting held on Thursday at which the issue of the system being adversely affected by students who sign on but opt out within a month was discussed. This had led to technical problems where in many cases students have ended up using Wi-Fi for free for months, it emerged. Taking its first innovative step, the newly formed Panjab University Student Council has proposed to host a separate legal and science fest at the university this year, in addition to the regular youth fest. 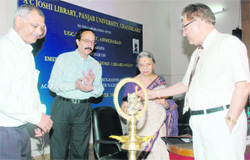 AC Joshi Library, Panjab University, in collaboration with Inflibnet Centre, Ahmedabad, organised a two-day seminar on “Emerging trends in academic librarianship”. St Xavier’s School, Mohali, celebrated founder’s day with full fervour. Principal Georgina Roy presented the annual report, highlighting academic and extra-curricular achievements of the school. Two persons have been killed in two separate road accidents in the Ambala area here in the past 24 hours. Sandeep Kumar Bose (31), working with an insurance company, was hit by a car near the Chidiya Line in the cantonment area. The Chandigarh police has registered a fresh case against Amit Kakkar, owner of Healthyway Immigrations. In the fresh FIR registered at the police station-36, the police has named 46 complainants who were allegedly duped by the company in 2010. 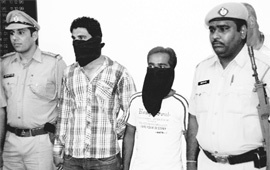 With the arrest of two youths, the district police claimed to have cracked the case of the ransom call and firing on the car of local builder Anil Kumar Bhalla. Local lad Sachin Kumar will face Udayan Bhakar of Rajasthan in the final match of the boys (U-14) category during the CLTA-AITA Super Series Tennis Tournament for Boys and Girls (U-14 and U-16) held here today. The Chandigarh Badminton Association has selected a 17-member team to represent the city in the upcoming All-India North Zone Badminton Championship to be held at Panchkula from September 24 to 26. Panjab University Campus team overcame GGS College for Women to finish first in the Panjab University Inter-College Netball Tournament for Women being played at PU grounds here yesterday. 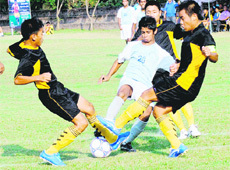 After one player of the local outfit was declared overage by a panel of doctors, the Chandigarh Football Association XI (CFA-XI) team played a draw against Sahayatri Football Academy of Howrah in a match of the 9th Administrator’s Challenge Cup Football Tournament for Boys (U-17) being held at the Football Stadium, Sector 17, and Sports Complex, Sector 42, here today. Local lad Rajat Khaneja went down to Dilip Kumar of Tamil Nadu during the six-red snooker championship held here today. Saksham Verma defeated Kanwar Sharma 5-0, 5-0, while Preet Kanwal overcame Pushpit Modi 15-0, 17-0 during the first day of the 21st Chandigarh State Carrom Championship being held at St Stephen’s School, Sector 45, here today. Teams of PCC, India Cements, Air India and Mohit-XI booked berth in the semifinals of the ongoing 18th All-India JP Atray Memorial Cricket Tournament being held here today. 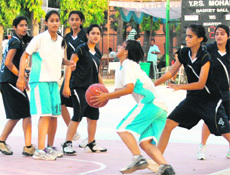 Yadavindra Public School (YPS), Mohali, defeated Vidya Devi Jindal School, Hissar, during a basketball match of the ongoing Indian Public School Conference Tournament for Boys and Girls being held at YPS grounds here today. Like the shorter version of cricket, the six-red ball format of the game will also help to popularise snooker among the youth of the nation, feels Asian billiards champion Alok Kumar.